Environmental Tree Care LLC has worked extensively with the city of Denver, BeASmartAsh.org and local municipalities in the development and ongoing implementation of Urban Forestry Management in Denver Colorado and Denver metro areas. 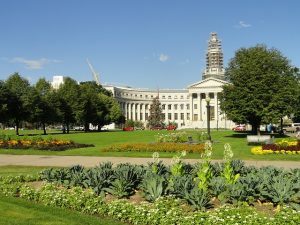 The City of Denver maintains planted, naturalized areas through best management practices such green belt thinning, removal and control of invasive plant species and xeriscape planning. Those practices create healthy forests that provide many environmental benefits. Urban construction, erosion, drought conditions, and presently, serious threats from invasive pests such as the Emerald Ash Borer all affect the Front Range and Denver forests and green belts. When any or all of these conditions persist, invasive species take advantage of the conditions and thrive, leaving little or no room for beneficial trees and other woody plants. We all have a stake in maintaining healthy urban forestryFollowing are some tips that you can implement to help Denver trees and green belts to thrive as we seek cooperative measures to maintain sustainability and growth. 1. Propagating and plant native plants can help maintain natural Denver habitats and keep invasive species at bay. 2. Watch out for any non-native, invasive species on your property. Nature.org provides an excellent taxonomy of the top invasive species in Colorado and in Denver. Here are three invasive species related specifically to forest and green belt management. Native to the Mediterranean, it was imported as an ornamental and intentionally planted, but it escaped gardens to spread across the continental United States. Now it crowds out native grasses and other perennials in large areas in Colorado and many other western states, reducing forage for wildlife and livestock. 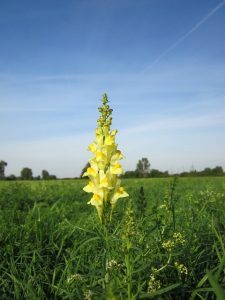 In addition to spreading by seed—a mature plant can produce 30,000 seeds annually—toadflax aggressively sends up stems from its extensive root system that can develop into separate plants by the next year. What you can do: Contact your local County Weed Manager for advice on removing yellow toadflax from your property. The state recommends using a combination of strategies, including herbicides, mowing and biological control agents. 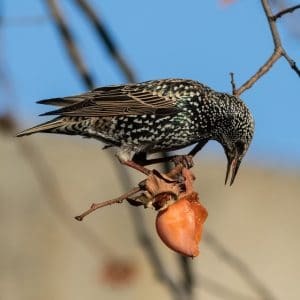 More than a century ago, European Starlings were released in New York City by a society dedicated to introducing every bird mentioned in Shakespeare’s plays. Now, with a population topping 200 million, they are one of the most common urban birds in the country. Chunky, highly social birds with iridescent feathers and distinctive whirring, popping vocalizations, starlings aggressively drive native species from their nests and feeding sites, even birds as large as wood ducks. They also damage crops, particularly fruit and sprouting grains, and may transmit disease. What you can do: Help native birds compete with starlings and other invasive birds by providing nest boxes that discourage starlings and plant native species in your yard. This tiny half-inch-long Asian beetle has killed millions of ash trees across the eastern United States and Canada. First introduced in Michigan in 2002, it reached Boulder in 2013. Although not yet widespread across the front range, officials confirm that it is only a matter of time. The only cure is prevention. What you can do: Don’t move firewood from one location to another. When you move wood, you move the pests. You can also protect individual trees with insecticides. 3. Only use approved waste collection services to dispose of garden waste. 4. Stay on improved trails in parks and recreation areas. The natural world of plants utilizes a process known as Succession. Over time, species that are more tolerant to shade will fill in and even replace species that are less tolerant to shade. When trees are properly trimmed, thinned and managed, Denver is able to provide natural habitats that mimic nature. For example, sun loving trees, such as Aspen provide habitat for the growth of longer living trees such as maple trees and oak trees. Trees and woody plants are a valuable resource in Denver, providing shade, natural habitats and water retention. When trees become diseased or die, they must be removed in order to make room for replanting and re-forestry efforts. Tree removal should be implemented by authorized contractors with proper licenses and permits. As mentioned previously, the Ash Borer has become one of the most, if not the predominant threat to valuable Ash trees on the Front Range. 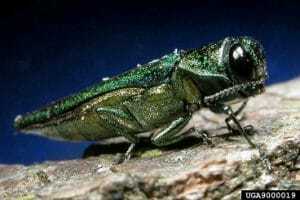 Diagnosing and treating Ash trees for Ash Borers should be done as soon as possible. Preventative measures are extremely important to prevent the spread of the species and unwanted damage to our trees.